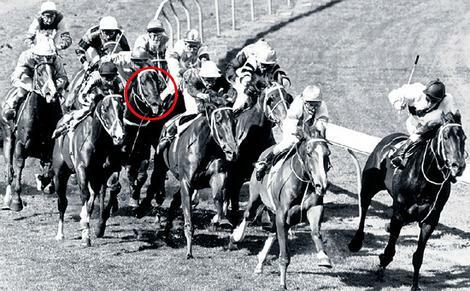 Arguably the greatest racehorse Australia has ever seen, Kingston Town was a true champion. Kingston Town was the winner of almost every group race in Australia, including 3 consecutive Moonee Valley Cox Plate’s in a row. Unlike some of today and yesterdays champions, Kingston Town was an incredibly versatile horse he had the ability to win sprint races and staying races and everything in between. He was trained throughout his career by Tommy Smith and ridden in 25 of his 30 wins by Malcolm Johnston. Kingston Town made his debut as a two-year-old in March 1979, and, in his only start as a colt, famously ran a distant last, but returned as a gelding in the final weeks of the season to win the Round Table Handicap at 33/1. 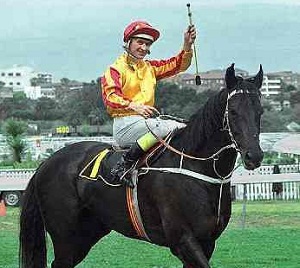 In 1980 Kingston Town backed up after winning 4 weeks in a row in the Sydney Cup. Drawn the extreme outside in a 17 horse field there were doubts he could find a position let alone stay the 2 miles but there was never a problem. Kingston Town flew the start and crossed the entire field to led early but settled in 5th on off the rail. By the 1200m Better Vibes led Kingston Town then Warri Symbol and Double Century. On straightening Kingston Town took the lead and powered away from Double Century then Marlborough and Favaloso. Under hand and heels Kingston Town won by 3 ¼ lengths from Double Century with Marlborough third. After running his last race in Australia, in November 1982, Kingston Town was sent to America on 15 February 1984 in an attempt to overcome his leg problems, but he did not race in the United States. He was returned to Australia, and, in 1985, an attempt was made to resurrect his career, but he was scratched from his scheduled race and retired. In March 1991, Kingston Town was put down after failing to recover from a leg injury that he suffered while playing with another horse, his favourite paddock-mate.